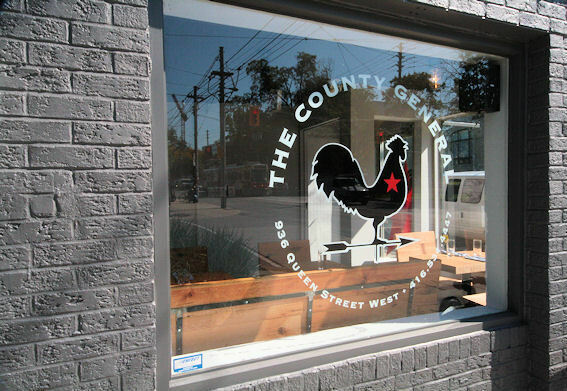 The County General is Splendido's tattooed cousin from the South, with a penchant for rock music and bourbon. But don't let its tough-as-nails attitude fool you, because just like with any other cowboy, its all a facade to cover up a big heart. Open for just over a week now (in the space that used to be Oddfellows ), I tried to go for brunch last weekend and it was jam packed. This place is already doing some serious business. Given my tendency to loiter I decided to go back at a quieter time, and that ended up being a Tuesday afternoon. 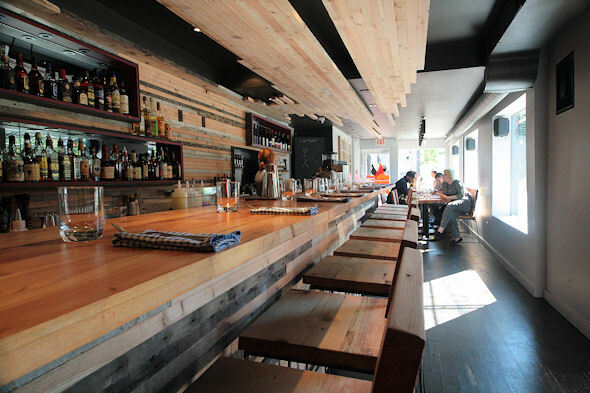 The space itself is open and bright, fairly minimalist in decor, and heavy on the lumber. Two-by-fours extend down the length of the ceiling in some places, and the entire back wall is like a very cool shrine to Rona...or Jenga. I received a warm welcome from Julia (who also goes by Colonel in these here parts) and was served by Bobby who was equally friendly as he was informative about the food and the restaurant (there isn't a farm they source from that they haven't been to first). 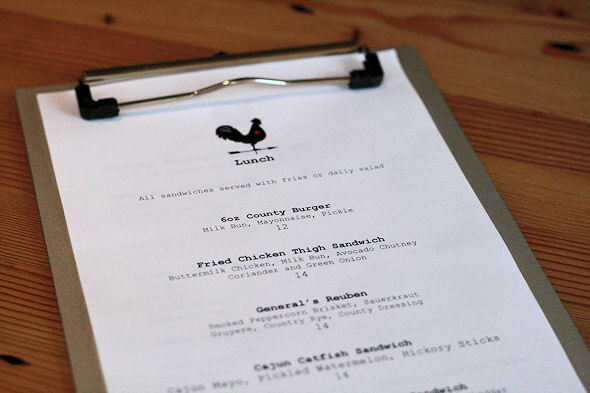 Their lunch menu is sandwich focused, while dinner has some of the same, with bigger dishes thrown in such as Grilled Flank Steak, Smoked Pork Belly, and Two Way Fried Chicken, with brunch being served up to hungry weekend folk. Seeing as it was 1:00 on a weekday, I perused the lunch offerings. The Heirloom Tomato sammie was very tempting, but I went with the Fried Chicken Thigh Sandwich ($14) because eating healthy is important to me. For this same reason, I chose the side of frites as my vegetable. 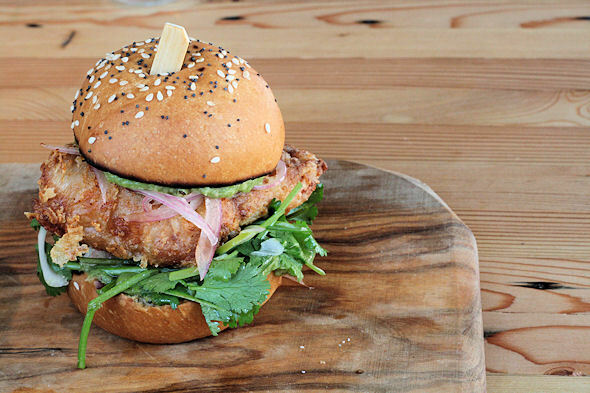 The chicken itself came on a buttermilk bun of slider size, given that chicken thighs aren't that big (lucky chickens...) and dressed with avocado chutney, coriander, and green onion. The chicken was very tender (Bobby informed me it was brined for two days), and although I'm not normally coriander's biggest fan, it and the chutney paired very nicely. All earlier facetiousness aside, maybe this sandwich isn't the most heart-smart option, but given its small size, it left me feeling full without feeling gluttonous or greasy. Really though, going to a place like The County shouldn't be about calorie counting, but about enjoying the comforts of Southern cooking. And I was comfortable. 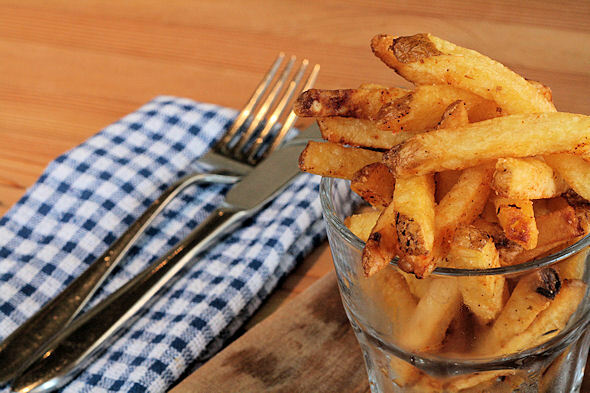 The frites came served in a lowball glass, sprinkled with spice and served with a smoked ketchup that's made in-house. There is a huge difference between good fries and great fries, and these were great fries. Crispy on the outside, and soft on the inside with enough heat provided by the spice to render a nice slow burn. Kinda wish they had been served in a highball glass. I had a lot to choose from for the liquid portion of my meal. 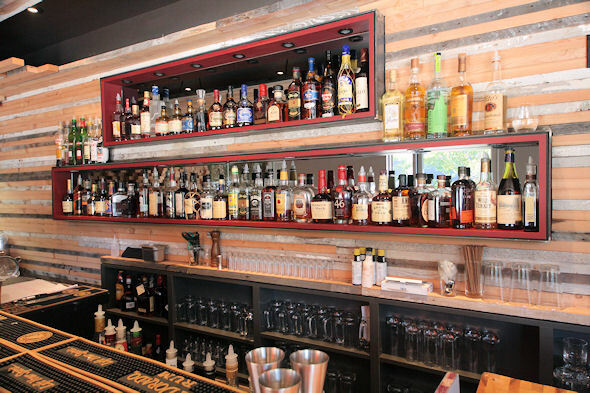 The County serves up Ontario VQA wines and locally crafted brews, but given their Southern roots, their passion lies in rum and bourbon. They offer 50 varieties of "grog" and "hooch", and even do flights of the stuff. My elbow twitched in anticipation of the bending it could do at a place like this. Given the warm weather, I had a hankerin' to quench my thirst with something a bit lighter from their cocktail list. 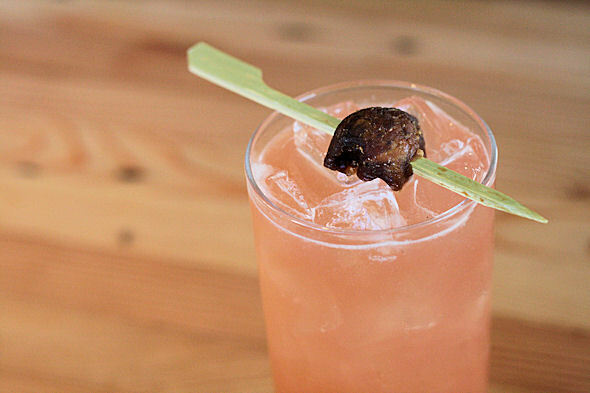 The "Figgy Dew"($16) which Julia claimed as her personal favourite, is made with Bulleit bourbon, fig, cucumber, lemon, topped with ginger beer and garnished with a dried fig. It was "figgin" delicious, but given the price I could only "figgy do it" once... okay, I'm done now. So having just quit my day job, as I sat sipping Bourbon (on a Tuesday afternoon) I realized that if it were 15 some odd years earlier, and there was a giant car wash across the street, I could have been the inspiration for a certain Sheryl Crow song. 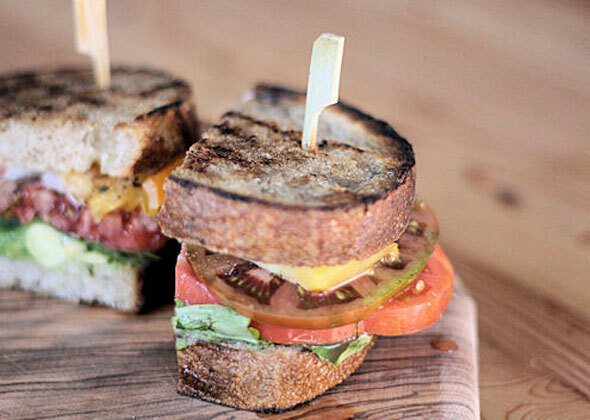 Footnote: I returned later in the week for that County Heirloom Tomato Sandwich ($10) after all. Seeing as it was consuming my thoughts, I in turn, consumed it. Turns out everyone had the same idea, because tomato sandwiches littered neighbouring tables. Served on toasted crusty bread, and topped with Ottawa Valley cheddar, mayo and that ubiquitous avocado chutney, it was delicious, but messy. Very messy. My cute blue and white gingham napkin didn't know what hit it. I would consider it for take-out in the future, to be eaten in the confines of my own home, where a mixture of tomato juice and mayonnaise running down my arm is more socially acceptable. I had the spicy fries yet again... they were calling to me, I swear it, but this time I chased them down with a pint of Muskoka Cream Ale.